WELLINGTON, CO --(eSolarEnergyNews)-- PSEG Solar Source, Platte River Power Authority and juwi today joined to dedicate the PSEG Rawhide Flats Solar Center. 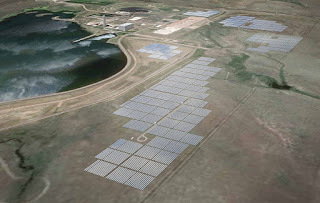 The 36.3 MW-dc (30 MW-ac) facility is located 25 miles north of Fort Collins, CO.
"We're pleased to partner with Platte River Power Authority to bring emission-free energy to its customers and in helping Colorado achieve its renewable energy goals," said Diana Drysdale, president of PSEG Solar Source. "By investing in solar projects like this one, we at PSEG are doing our part to lay the foundation for a clean, green and economically vibrant energy future for everyone." "This facility is a significant step in the continued diversification of our generation portfolio," said Jason Frisbie, Platte River general manager and CEO. "It reduces the risk of depending on any single source of fuel and increases our renewable resources." The Rawhide Flats facility has been in startup mode for the past week and should shortly begin commercial operations. Once it begins commercial operations, PSEG Solar Source will have 15 facilities in service in 11 states with a total capacity of 215 MWs. It has two facilities, totaling 100 MWs, in construction which it expects to have in service within the next two months. This latest addition to PSEG Solar Source's portfolio represents an investment of more than $54 million.